Having a sale? 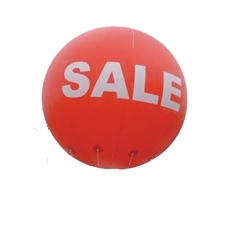 Giant Round Sale Balloons are a perfect way to get the attention of your customers! All Sale inflatables are double side imprinted. Made of Reusable lightweight polyvinyl. Includes nylon harness, 125 ft of nylon tether line, a vinyl repair kit and an inflation hose. Holds approximately 210 cubic feet of helium. Lift weight is 8lbs. *Custom orders please contact us.